• Resolución de pantalla: 2560 1600. • Sistema operativo: Android 7,1. • Compatible con la cantidad de la tarjeta SIM: doble tarjeta de espera Double. • Interfaz de e/S: una toma de auriculares de 3,5 mm, una interfaz micro USB, una ranura para tarjeta TF, 2 ranuras para tarjetas SIM. Support Android 6.0, coupled with the advanced MTK8321 CPU, gives this product great performances and better using experience. Besides, this tablet support dual sim card. D. 2GB RAM and 16 GB ROM ,TF Card Support up to 32 GB: s uitable RAM keep the tablet working smoothly,which is equipped with huge storage capacity that you can download whatever you like from network and save them. 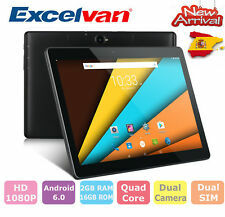 Tablet XGODY 10.1" 2GB RAM - Quad Core - DUAL SIM - 16GB - 3G - HD - NUEVA!!! Excelvan M10K6. Model M10K6. Besides, this tablet support dual sim card. Furthermore, special appearance of this product and. and brings your photos and videos to be more clear. Support Android 6.0, coupled with the. Support Android 6.0, coupled with the advanced MTK8321 CPU. B. MTK8321 Quad Core Cortex A7 @ 1.3GHz CPU : e xcellent data transfer capability may surprises you, which lets you watch videos fluently. •Maximum storage expansion: MicroSD (TF) 64G. Maximum storage expansion: MicroSD (TF) 64G. Support SIM card quantity: dual card dual standby. I / O interface: a 3.5mm headphone jack, a Micro USB interface, a TF card slot, 2 SIM card slot. Micro Sim Card Slot 2. --Android :Android 6.0. Enhanced performance: Android 7.0 system with MT6735P Quad-core A53 64-bit processor 1.3GHz, ensures quick app launches and easy multitasking. Everything is more responsive and fluid. Support Android 6.0, coupled with the advanced MTK8321 CPU, gives this product great performances and better using experience. Besides, this tablet support dual sim card. Model M10K6. 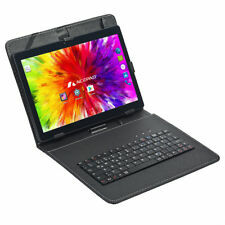 D. 2GB RAM and 16 GB ROM, TF Card Support up to 32 GB: s uitable RAM keep the tablet working smoothly, which is equipped with huge storage capacity that you can download whatever you like from network and save them. Besides, this tablet support dual sim card. Resolution 1280 800. Support Android 6.0, coupled with the advanced MTK8321 CPU, gives this product great performances and better using experience. B. MTK8321 Quad Core Cortex A7 @ 1.3GHz CPU : e xcellent data transfer capability may surprises you, which lets you watch videos fluently. 3G:(WCDMA 850MHz/2100MHz). Android 5.1 lollipop. USB HOST 2.0 high speed interface (Micro),Support Extra Hard Disk, Ethernet, 3G Dongle and other peripherals. 2 Standard Sim Card Slot. 1 x Tablet PC. Tablet Weight . Support Android 6.0, coupled with the advanced MTK8321 CPU, gives this product great performances and better using experience. Besides, this tablet support dual sim card. F. Built-in 802.11 b/g/n / ac, Dual Band WiFi: would provide a reasonable distribution of wifi flow. RAM: 1GB ROM: 16GB. CPU: Quad Core CorteX A7. Sistema operativo: Android Marshmallow v.6.0. Color: Blanco. 3G: WCDMA 2100. Compatibilidad tarjetas SD: Hasta 32GB. Conexiones: MicroUSB (OTG) / Jack 3,5. Tablet IBOWIN dual sim ANDROID 8.1 telefono movil LIBRE 3G 16GB 1GB RAM 7"
IBowin S.L fue fundada en 2009, nuestra fábrica y domicilio fiscal está en Shenzhen, China. Ibowin Industry Limited was founded in 2009, our factory is based in Shenzhen, China. Android 8.1. 3G WCDMA 2100MHz. LESHP 10.1'' Tablet PC Android Quad Core 4G LTE Dual SIM 2 16GB 2Cámara Rosado . 3GWIFI 3G. 14 días de. Estamos para ayudarte. Disponibilidad: En existencia. CAJA ORIGINALSI. SISTEMA OPERATIVOANDROID. Bebés juguetes. Support Android 6.0, coupled with the advanced MTK8321 CPU, gives this product great performances and better using experience. Besides, this tablet support dual sim card. B. MTK8321 Quad Core Cortex A7 @ 1.3GHz CPU : e xcellent data transfer capability may surprises you, which lets you watch videos fluently. Excelvan M10K6. Besides, this tablet support dual sim card. Furthermore, special appearance of this product and. and brings your photos and videos to be more clear. Support Android 6.0, coupled with the. Model M10K6. Besides, this tablet support dual sim card. Furthermore, special appearance of this product and. and brings your photos and videos to be more clear. Support Android 6.0, coupled with the.